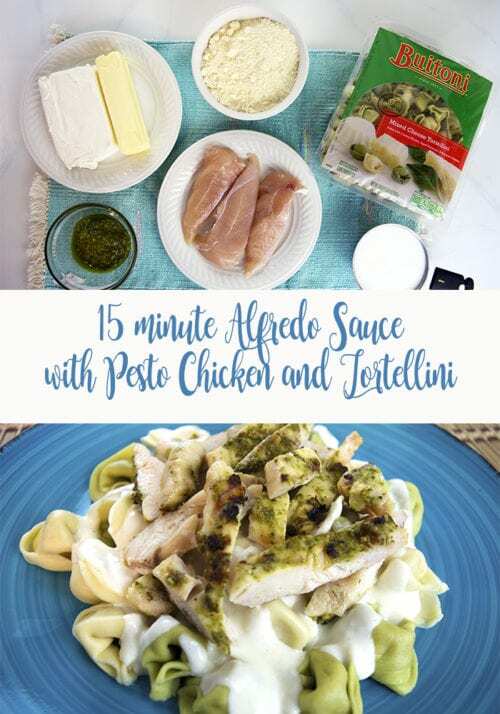 This 15 minute Alfredo sauce is the easiest pasta sauce (that doesn’t come in a jar) you will ever make! 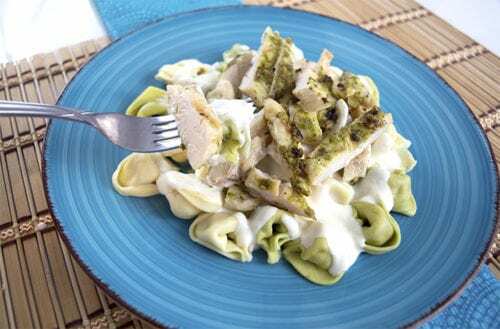 Serve it with easy Pesto chicken, over tortellini and you’ll have the perfect meal in less than 30 minutes. A simple dinner recipe idea. Hi, Crafty Blog Stalkers! This is Kelli visiting today from KsCraftShack. I post over on my blog about crafty things, and I don’t very often take the time to share recipes there unless it’s craft related, so I am really excited to share this recipe here with you today! It is my families very favorite meal and we have it often. When I was little I wanted to be a Chef when I grew up! Right out of high school I went 1000 miles away from home to attend Culinary School, and it was a blast! I love to cook! It is my dream someday to open my own little place, but in the meantime, a cooking career can sometimes not be a very family friendly career. So now I do a different kind of Art in my She Shed in the backyard, and my cooking has taken on a slightly different style… fast and easy. With three kids (one a toddler, and another Autistic), sometimes I don’t have as much time as I’d like to make a time-consuming gourmet meal. That’s why I love this recipe, it’s so fast and easy, and you would never know it wasn’t a fancy gourmet recipe! 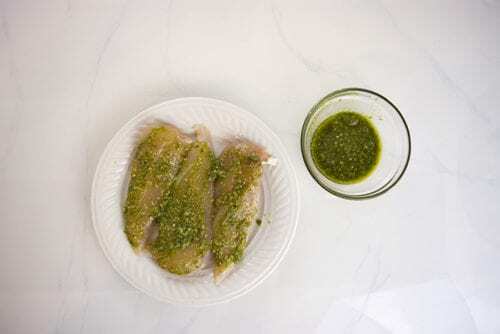 Start by marinating your chicken tenders in the Pesto. Rub it in good, and let the chicken sit (in the fridge of course) for at least 30 minutes. 1-2 hours is best. Toss your chicken on a hot grill and cook through (to 165° F). Set aside to “rest.” Allowing your chicken to sit for at least five minutes after cooking and before cutting will help it to be extra moist! I cook the chicken just after I start my sauce. The chicken can grill while the sauce gets melty and delicious! 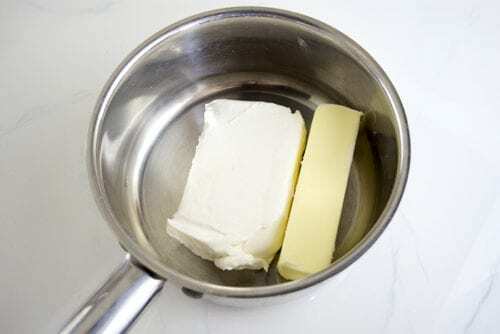 On low heat, melt the cream cheese and butter together in a small pot. 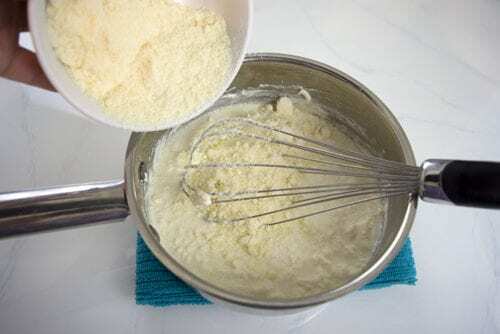 When it looks like the picture below, whisk it together until it’s nice and creamy and smooth. 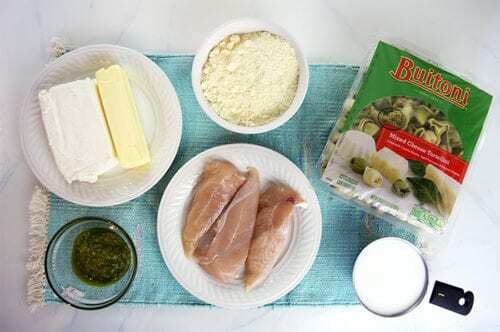 When the cream cheese and butter are melted together and smooth, add the cup of grated Parmesan and the milk. I find that the cheap store brand Parmesan is not really worth it for this recipe. Store brand everything else is perfect, but don’t skimp on the Parmesan it makes a difference in the finished taste. I use whole milk, but if you wanted this Alfredo to be slightly lower fat, you can use low-fat cream cheese and a lower fat milk without any problems (1% is fine, skim milk or fat-free, is a little bit too low fat). 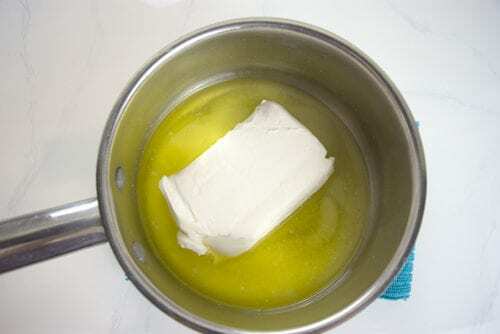 Whisk it together until it’s combined, and then continue cooking over low heat, stirring occasionally, until the sauce is smooth and creamy. About 10 minutes. Add a dash of salt, to taste. 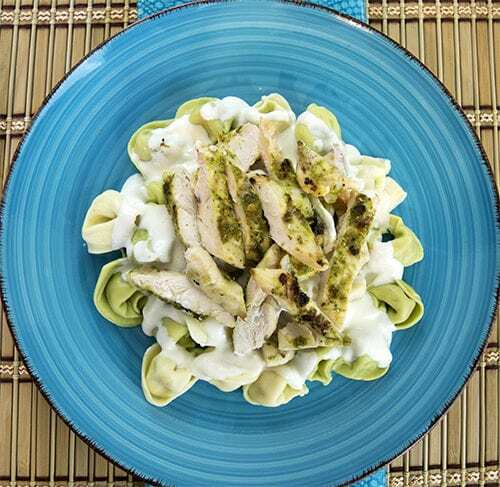 While your Chicken is grilling, and your Sauce is melting, you can get your pasta going too. Cook the pasta as directed on the packaging. It’s always better with pasta to have too much water rather than not enough. You can absolutely serve this recipe with regular Fettuccine noodles. We do it that way sometimes! 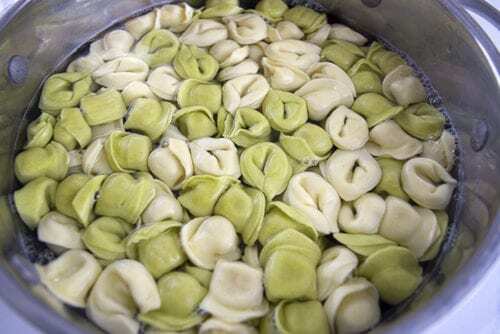 But my kids far prefer the tortellini with this recipe. The little bit of extra cheesy goodness inside the tortellini just puts everything over the top delicious! 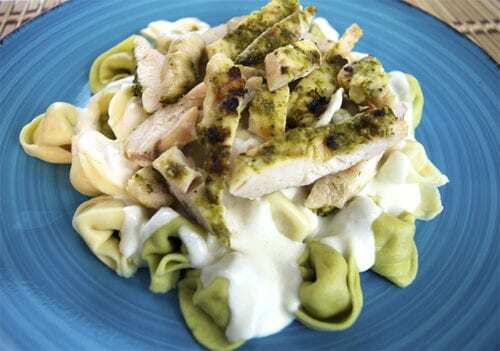 Serve by pouring the sauce over the noodles, and topping with sliced Pesto chicken. We love having roasted broccoli on the side with this meal, but any veggie side would be fantastic. We use this Alfredo sauce recipe every time we want a white pasta sauce. It’s so quick and easy and with just four ingredients and no difficult steps it’s a perfect recipe if you don’t have much time and want something delicious with minimal effort. Toss it in, let it get melty, stir a few times here and there, and voila! The very best part about this recipe though is that even my picky eaters will eat it. I really hope you enjoy it as much as we do! Thank you so much for letting me share my favorite dinner recipe with you! I will see you again here next month, and in the meantime, I’d love to have you stop by and visit me over at the Craft Shack! This looks delicious! Thanks for sharing this amazing recipe, I’m really looking forward to trying it! You are so welcome, Denise. Enjoy!